Alex Winters, Aneta Lesnikovska, Anika Schwarzlose, Annaleen Louwes, Anneke Hymmen & Kumi Hiroi, Anu Vahtra, Aurelio Kopainig, Axel Koschier, Betty Ras, Carolin Reichert, Charlott Markus, Chris Oatey, Chris Rijk, Daniëlle van Ark, Diana Blok, Eva Schippers, Eva-Fiore Kovacovsky, Hanna Mattes, Hristina Tasheva, Ine Lamers, Irina Birger, Jaap Scheeren, Jacopo Calonaci, James Beckett, Jean-Vincent Simonet, Jessie Yingying Gong, Johannes Schwartz, Joris Landman, Joseph Miceli, Jouk Oosterhof, Kali Rose, Katja Mater, Khurtova/Bourlanges, Koen Hauser, Kyle Tryhorn, Lonneke van der Palen, Lorena van Bunningen & Majda Vidakovic, Martijn van Nieuwenhuyzen, Melanie Bonajo, Mike Ottink, Noa Giniger, Oran Hoffmann, Pantelis Makkas, Pier Pennings, Popel Coumou, Riley Harmon, Risk Hazekamp, Roberto Pérez Gayo, Scheltens & Abbenes, Selene Kolman & Martine Stig & Stef Kolman, Semâ Bekirovic, Sohrab Bayat, Stefanie Wels, Svenja Kaufmann, Tania Theodorou, Thomas Monses, Vincent Zedelius, Voin de Voin, Willem Vermoere and Yang Qiu. Did you miss us? We are happy to inform you that after skipping a year, we've come back with a vengeance! If you have never been at one of our auctions, you are in for a treat! Cocktails, tote bags and our limited edition hand-printed and hand-bound book Looking Back-Moving Forward available! We highly recommend you arrive by 2:00pm at the latest. Lots of fun stuff going on at Foam all day, we auction off our first lot by 3pm sharp. We have many incredible artworks to auction so please do come in time. Extra reason to come early? At 2:45pm we kick off with a raffle for a 100€ voucher to be spend at the auction. Your Entropy catalogue is your raffle ticket! Dead Darlings is an anonymous art auction founded in Amsterdam in 2005 as a platform to explore the complex love triangle between artist, artwork, and collector. Including a mix of established and emerging artists, each lot is sold anonymously, and authorship is only revealed after the sale is complete! By asking for art that has been “killed” and encouraging artists to offer up beloved and unique works at very low starting prices, we are able to extend the label of “art collector” to people who would not otherwise be able to afford original contemporary art works. DEAD DARLINGS #9 is a co-production of DEAD DARLINGS and FOAM, supported by AFK, AMSTERDAM FONDS VOOR DE KUNST. For more information please write to dd@deaddarlings.nl and check www.deaddarlings.nl and www.foam.org for updates! 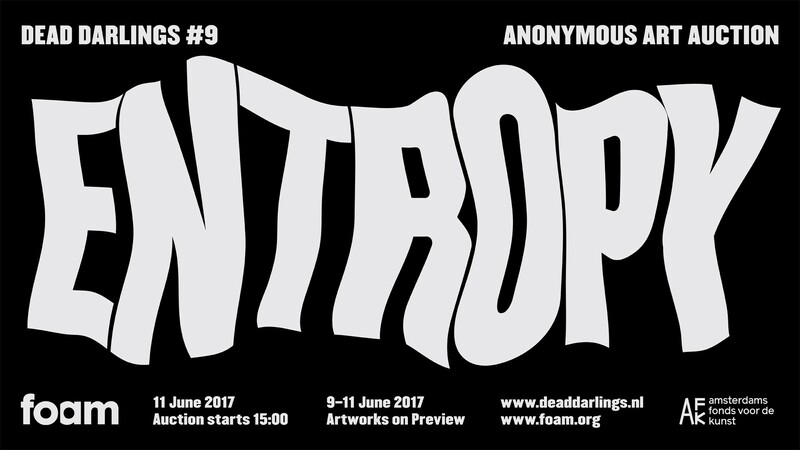 This year our theme is Entropy, the journey from order to disorder, as experienced by the artist, the work itself, or both. The auction is held in an informal and casual atmosphere where the act of selling and acquiring art becomes a performance in its own right. The building of enthusiasm for these little outcasts binds makers and lovers of art together. We see it as a liberation, where every Darling gets the second chance it deserves. All sales will be cash only so bring as much as you can spare! There is an ATM round the corner in case you get carried away and go over budget, but please help us keep things quick and easy by remembering to bring cash!